The top-line news articles that come up on a Google search when one enters the term “antibiotics” is truly an eclectic bunch. Here is Page 1 of search results after eliminating some duplications. We have a few comments on these headlines for “Breaking News”. This article is based on a retrospective review of studies on the non-operative treatment for appendicitis. Instead of performing an appendectomy, antibiotics were administered. Complicated cases (perforation, abscess) were excluded. The literature search identified only 10 studies, providing a surprisingly small (N=413) sample size for analysis, and none of the studies were “high-quality”. In general, various broad-spectrum antibiotics were administered, often in combination. The non-surgical patients did very well; initial antibiotic treatment appears effective (in 97% of cases) and safe. The authors conclude that surgery is probably not needed in most cases but – given the soft data situation – also add lots of caveats and disclaimers. With a common condition like appendicitis we should not have to rely on the findings from a small non-representative data set. There are approx. 250,000 cases of appendicitis in the US alone, most are referred to surgical therapy. The records collected by a Kaiser Permanente or other health care provider would be expected to have better and more complete data. Certainly their sample size would be significantly larger. In the absence of a prospective study, we are dealing with meta-analyses, either based on published literature or an insurer’s data collection. With everything else being equal, larger is better in our opinion. Not really a surprise! Wanting to oblige, or just to avoid lengthy discussions when the waiting room is full, this habit will die only slowly. This study was conducted in Great Britain. Some 50% of online pharmacies do good business with antibiotics without asking a lot of questions, some were not even registered to MHRA. However, the statement that this practice is ‘fueling the rise of superbugs’ is mere conjecture, an extrapolation not supported by the data. Likewise, one could also state that this practice is ‘fueling the obesity epidemic’ as antibiotics are growth-promoters, not only in animals. Equally stupid. 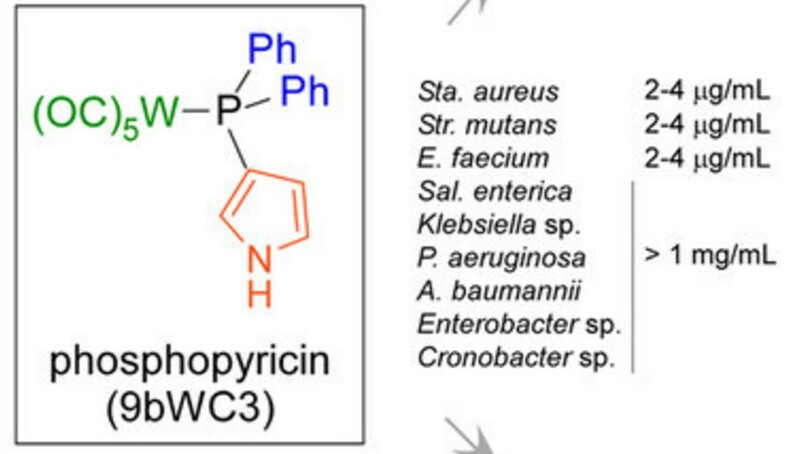 Something new and semi-interesting: We are informed that phosphopyricin, a new synthetic antibiotic with a structure unlike any available class of compounds, has activity against MDR pathogens, a bactericidal MoA, and low toxicity in animal studies. Its structure (see figure) contains tungsten, the W atom (which stands for Wolfram in case you are interested). The spectrum of activity includes S. aureus and enterococci (both E. faecalis and E. faecium), with MICs in the 2-8 mg/L range. Unfortunately, Pseudomonas or Acinetobacter are not susceptible. It is also a very light-sensitive compound and degrades easily in nature. A retrospective study of patients with metastatic RCC treated with immune checkpoint inhibitors PD-1 found an association between prior antibiotic use and a much reduced PFS time. Without a publication, this press release is just that – a press release. Dealing with MDR infections in their patients is as difficult for MSF as it is for any other institution or referral center. Improving access to microbiology lab services is an urgent need for those who work on the frontlines. Do You Really Need to Finish All Your Antibiotics? We will have a separate blog about the topic of ‘duration of antibiotic therapy’ coming out soon. Good to know. Actually, we knew that already, so thanks for reminding us. Slim pickings for news-worthy news, I’d say. Although this was not a representative sample and there are some (964,000 – 10) more links to check, we lost interest after Page 1. Sorry! This entry was posted in Recent Literature, The News, The Viewpoint and tagged antibiotic blog, Google search antibiotics, Harald Reinhart, MSF and resistant infections, new antibiotic, PFS reduced by antibiotics, phosphopyrocin, treatment of appendicitis, tungsten by Harald. Bookmark the permalink.